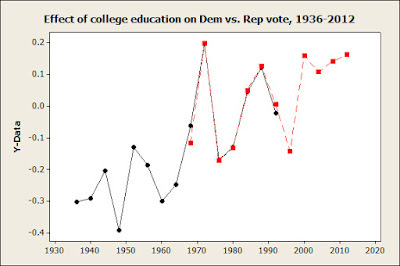 Here is the estimated effect of college education on the chance of voting Democratic vs. Republican in presidential elections, 1936-2012. The black line is from the data described in my last post; the red line is from the cumulative GSS. The two sets of estimates for 1972-1992 should be exactly the same, since they both use GSS data (1968 was a combination of GSS and Gallup data). They are not quite identical, so there must have been small differences in how I coded education or what I counted as missing data, but the differences are very small. 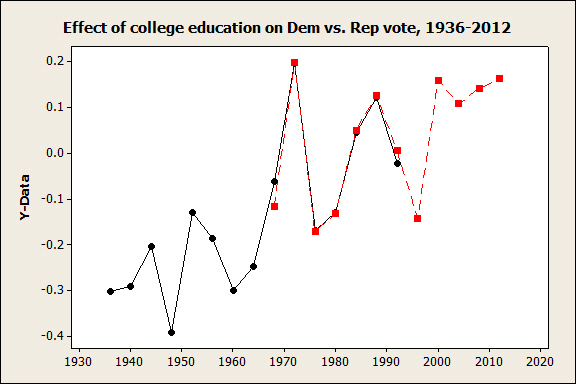 Over the whole period, there is a definite tendency for college education to shift in a pro-Democratic direction, but also a good deal of variation from one election the the next. 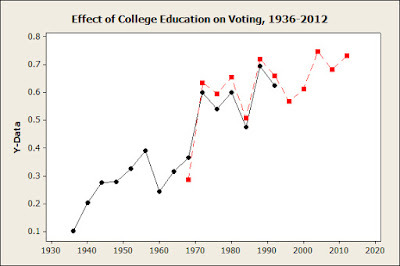 Here is the estimated effect of college education on the chance of voting. The discrepancies are larger, but the trend is clear: college education makes more difference as time goes on, and there isn't much variation from one election to the next. 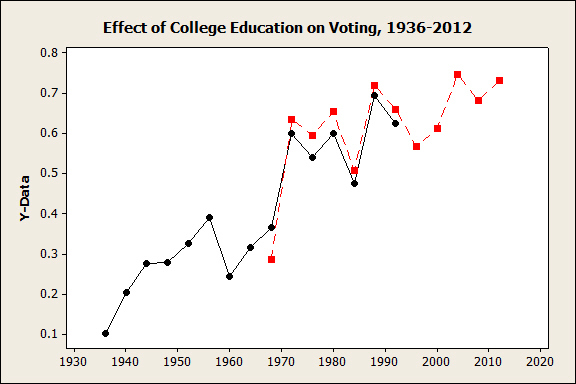 Since voter turnout among people with college degrees is high, in practice this means declining turnout among people who didn't attend college.